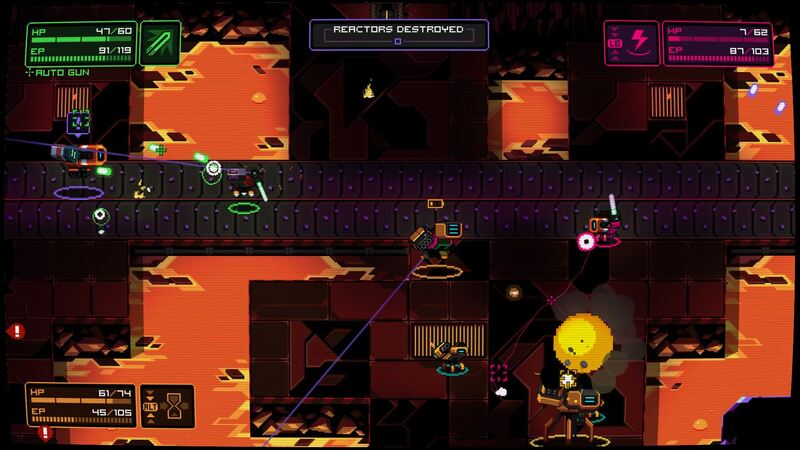 Take one part twin stick shooter, one part roguelike RPG, toss in awesome couch co-op and mix it all up with very appealing retro-style presentation and you have NeuroVoider, one of the most addictive indies we’ve played in a while. Featuring fast paced gameplay, a satisfying upgrade and customization system, and fantastic couch co-op, NeuroVoider is fresh and fun and totally worth a look. See all of the details here in our Xbox One review. NeuroVoider is a roguelike RPG where death comes early and often and every time you die you have to create a new character and start over. The objective is to fight your way through 25 levels and beat the final boss. Your reward for that? Taking your character over to New Game+ and doing it all over again. For roguelike games to be successful they have to hit a fine balance of addictive gameplay and satisfying rewards that compel you to keep playing death after death after death until you learn how to play properly. I can happily report that NeuroVoider totally nails it. Your character is basically a brain in a highly customizable robot body. You can choose from different pieces and parts for your little robot that change their movement speed, HP, how much energy they have, special abilities, weapon types, and more. After every level you complete you’ll have a brand new pile of loot to sort through to customize your robot with and the whole process is surprisingly addictive. Wanna build a HP sponge tank? Do it. Wanna play as a nimble and fast robot that teleports through bullets and around enemies? Do it. Want to focus on melee? Do it. Want to blast screen clearing nukes in every direction? Do it. 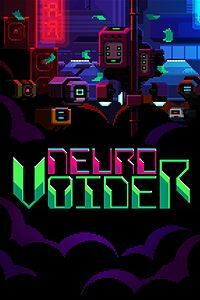 NeuroVoider overwhelms you with new parts to bolt on and a ton of different weapon types to play with. When you die it’s just a good excuse to try a totally different build and new weapon combo and have more fun. The gameplay in NeuroVoider is basically a very solid twin-stick shooter. You move around with one analog stick and aim with the other, then shoot your two weapon types with the two triggers. You only have a finite amount of energy, however, so just holding down the fire buttons without letting it recharge in between shots will blow through your energy stash and leave you vulnerable for a few seconds. Those few seconds are all the A.I. enemies need to swarm around and kill you. Once you get into the rhythm of the gameplay, though, NeuroVoider feels really good. The controls are responsive and precise and it just plays really, really well. Because the levels are procedurally generated, and you have such a wide range of build options, the game has a ton of variety that will keep you coming back for more and more. NeuroVoider gets even better when you play co-op with friends. The game is definitely playable and fun solo, but playing couch co-op with up to four players makes it even crazier. Making complimentary builds and working as a team is just awesome. It is a bit of a shame that there isn’t an online co-op option, but we’re not that fussed about it. Presentation in NeuroVoider is pretty fantastic all around. The game has a retro sprite-based aesthetic and looks really good. It has a similar look to Hyper Light Drifter. They did a great job making all of the enemies and bullets flying all over the screen – it’s basically a bullet hell game at times – really distinct so you know exactly where everything is, where the bullets are coming from, and how to avoid them. Bright neon colors dominate the palate and it looks great. NeuroVoider also sounds great, too, with a thumping synth soundtrack. All in all, NeuroVoider is a pretty great little indie that I can’t recommend enough. I initially checked it out because I loved the way it looked and the music in the trailers was awesome, but the satisfying gameplay and addictive upgrade loop really hooked me. And it only gets better in co-op. 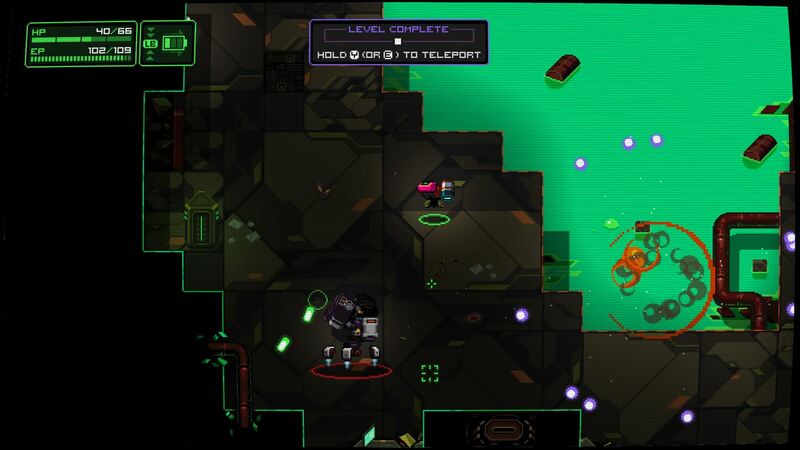 NeuroVoider is a fantastic hybrid shooter / roguelike that I highly recommend for a purchase.